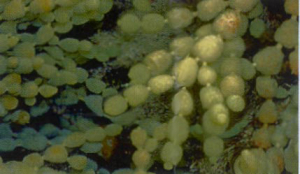 Neptune’s Necklace is a brown alga that flourishes in rock pools and on horizontal inter-tidal rock surfaces. The fronds consist of a string of rounds vessicles or beads that are full of air to keep the plant upright in the water. These beads have small yellow light spots indicating the position of reproductive cells. Many minute and juvenile crustaceans and molluscs shelter underneath this seaweed.